I admit it. I just love John Green’s books. I started with Will Grayson, Will Grayson, which I guess is sort of backwards because it was his most recent work. But I loved it so much that I stepped back into Looking for Alaska and now Paper Towns. Once again, Green has done a great job of showing teen relationships—the group of guys at the center of this story (our protagonist and his two best friends) is hilarious. Q (for Quentin), Ben, and Radar (who edits Omnictionary, a fictional Wikipedia, and whose parents own the world’s largest collection of Black Santas) are spot-on in their conversations, their ‘dissing’ one another, their geekiness, and in the way they ultimately have one another’s backs. But while we do have a bit of ‘bromance’ here, the deeper story is about Q’s relationship with Margo Roth Spiegelman. At school the next day, Q is wondering if he’ll be able to connect with Margo once again. But she’s not there. In fact, she’s disappeared, something that’s happened a few times before as she has careless parents and seeks attention. But this time, she doesn’t return. And now Q has a mission—to find her, to figure out if she’s committed suicide—certainly a possibility judging from the clues she’s left. He begins to follow her path starting with a volume of Walt Whitman’s Leaves of Grass and using passages she’s highlighted. 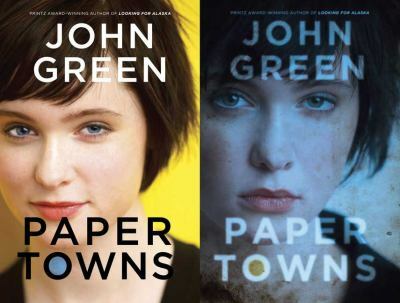 Q seeks Margo in ‘paper towns,’ neighborhoods/subdivisions that were built and then abandoned. In seeking Margo, the guys and one of Margo’s friends (now also girlfriend of Ben) take a 24-hour road trip. It’s life-changing, just the way a graduation should be. This entry was posted in Adventure Stories, Family Problems, Fiction, Literary Read Alike, Young Adult Literature. Bookmark the permalink.